There are certain things in life where quality wins over quantity every time – jewellery is one of them. Petersens Jewellers in the Bush Inn Centre takes pride in offering treasures and memories to last a lifetime. Synonymous with high quality brands, selected and sourced by owner/operator Brent Morrison from a global resource pool, Petersens offers a curated collection of only the very best. Seiko stands as testament to this quality as one of the world leaders in watches, with the brand’s latest collection of Astron watches now available in store. Combined with form and function, the Seiko GPS Astron watches are entirely light powered and are capable of syncing date and time zone automatically using a global network of GPS satellites. Sporty, classy and modern, the 2018 model is now 200 metres water resistant, making it a tough watch to beat and the ultimate watch for avid travellers. Available in stainless and titanium versions, these highly functional dress watches offer the ultimate arm candy for the man in your life. This September, Brent is making his regular trip across the globe to Antwerp – the diamond capital of the world – to source the best diamonds for his bespoke creations. 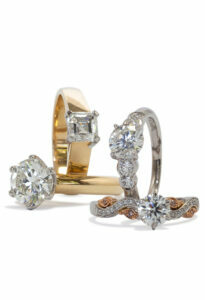 This ensures the highest quality stones and the most sparkles in its range of diamond rings and necklaces. The possibilities are endless when you can choose from the best.